Rick Remender’s epic story continues with this collection. The Dark Angel takes control of Warren (Angel) Worthington’s body. The fall into darkness brings disaster to the team. Rememder started with this title, continued storylines into “Secret Avengers” and now is following up on them in “Uncanny Avengers”. 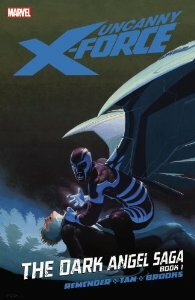 “Uncanny X-Force” is another interesting Marvel series that draws on the past while building the future.